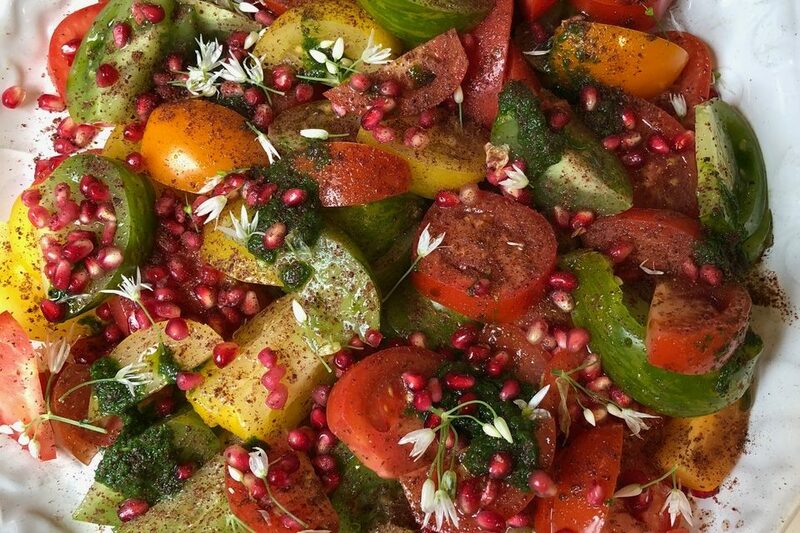 Simple and delicious, our heritage tomato salad with sumac, pomegranate and salsa verde is the perfect accompaniment for a barbecue or summer supper. This dish is ridiculously easy to make, but will leave any guests impressed. 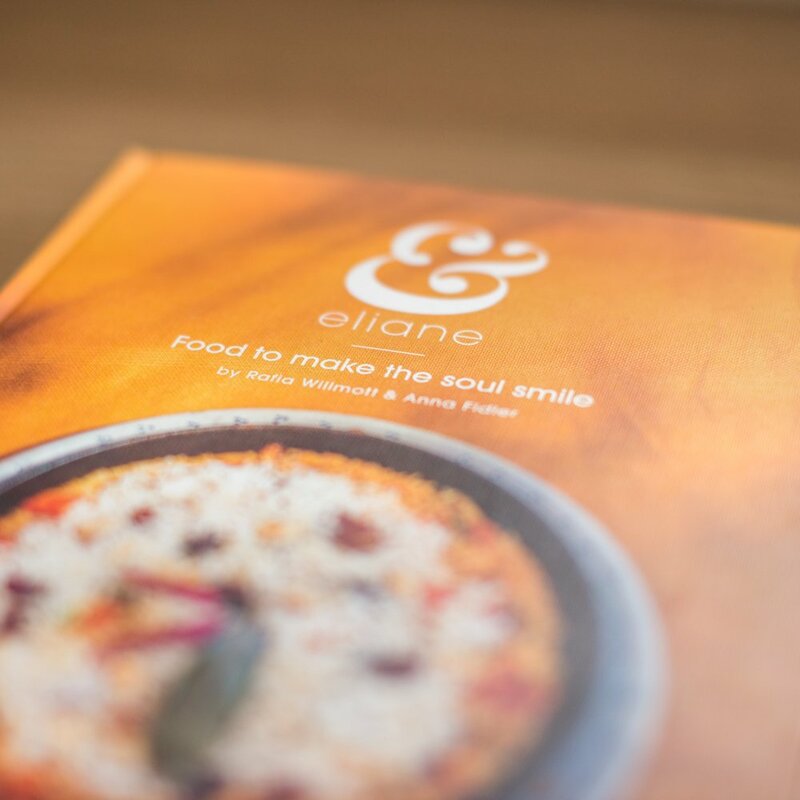 It’s been so well received in both branches recently that we’ve put together a recipe so that you can recreate it at home! Halve the pomegranate, and using a large spoon, tap the outside of each half firmly over a bowl to release the fruit. Remove any bits of pith which may come loose and set aside. For the salsa verde, take a large handful of basil, another of parsley and add to a food processor with a good measure of extra virgin olive oil, a squeeze of lemon and two peeled cloves of garlic. Blitz until smooth. The salsa verde shouldn’t be too thick and should run off the spoon fairly easily. Use a little more olive oil if the mixture is too thick, then set aside. Wash the tomatoes, then chop roughly. They don’t all have to be the same size! Mix the olive oil, sumac, lemon juice, salt and pepper together and then gently massage through the tomatoes. Don’t be tempted to use a until as you will end up mashing the tomatoes. 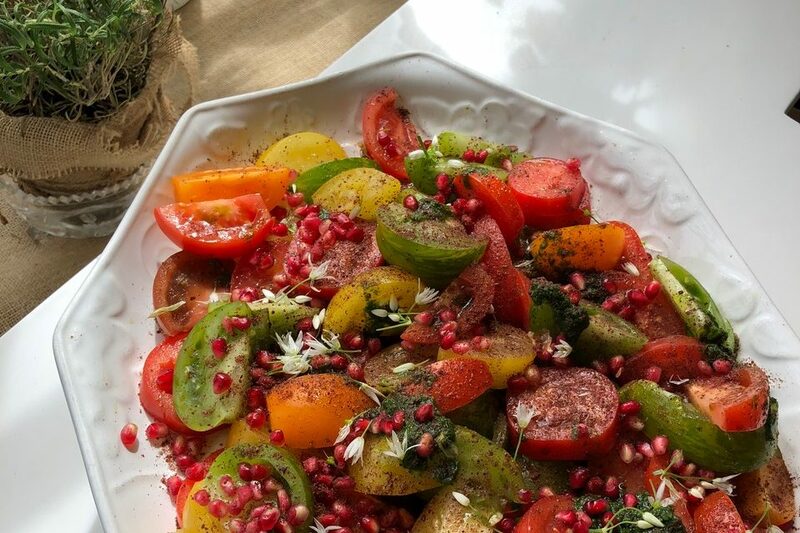 Arrange the tomato mixture on a serving platter, sprinkle with the pomegranate seeds and then drizzle with the salsa verde. If you’d like, use wild garlic flowers or nasturtiums for an extra pop of colour. And that’s it! Simple, super delicious and healthy to boot. Tried it? Let us know how it went! Want to be somewhere else?